With reports of Black Friday sales down more than $1 billion in bricks and mortar stores, some retailers may be starting to panic, thinking it’s probably too late to jumpstart holiday sales. And, by most conventional standards, it would be—with the holiday shopping season now in full swing, the predictions, promotions, distribution plans and in-store displays have long been set in stone. With just days remaining, it’s impossible to change course now, right? Not so fast. Using a new approach to business intelligence analytics, retailers can get timely insight into consumer shopping trends to make adjustments, change up promotions and capitalize on up-to-the-minute shifts in consumer behavior, hot-selling products and more, down to the final hours of the season. The problem with most conventional predictive analytics programs is that they’re extremely complex, requiring weeks or months of dedicated, sophisticated statistical expertise to crunch the numbers and deliver analysis. By the time these models are crafted, using a traditional hypothesis Q&A process, the data upon which they are based are outdated, not to mention the fact that you have to know the right questions to ask in the first place. That means, for holiday shopping, retailers must stock and promote product in November and December based on forecasts made in July or August. And, if you asked the wrong questions months ago, your entire prediction and plan could be flawed. Instead of statistical scientists choosing a data set, asking a specific question and then running the analysis to get an answer, smart pattern discovery automatically asks all the questions at once, surfacing the most relevant, meaningful and actionable data, using the power of cloud computing to work quickly, even on the largest data sets. No more trial-and-error Q&A. No waiting weeks or months for an answer. And, no worries about whether you asked the right question in the first place. In fact, you don’t even have to ask for the analysis—you can schedule to have the latest charts and graphs of the most meaningful data delivered automatically to your dashboard or inbox on the interval you choose—weekly, daily or even every few hours. With smart pattern discovery, you get answers to questions you didn’t even think to ask, helping you to make smarter, more immediate, and more strategic decisions to maximize holiday season (and year round) success. Act on the most current data. Conventional prediction models take too long to craft and update, forcing you to make decisions based on stale data. And, since we know that consumer behavior is fickle, having the most up-to-date data matters. In the era of social media, all it takes is an influential style watcher or blogger to discover and declare this year’s “it” product, and the entire trend could shift. When a model can be created, updated and acted upon faster—in days or hours, not weeks or months—you can act on that insight faster, adjusting promotions, product merchandising, etc. to gain a major advantage, while your competition is still trying to figure out why their forecasts are failing. Improve agility with dynamic dashboards. Conventional analytics dashboards work like the dashboard in your car: they show you the same data, but only the values change. But what happens if something important goes on outside those pre-determined graphs and charts? If new trends or anomalies appear, you might never know it. For example, let’s say a national chain retailer is watching average store sales, and everything seems to be trending just as expected. But, under the surface, the reality is that sales in the northeast are dropping fast, thanks to an unexpected snow storm that has kept shoppers at home, while gorgeous weather and a state sales tax holiday in three southern states have sent sales soaring. Conventional “average sales” dashboards would never reveal this discrepancy. 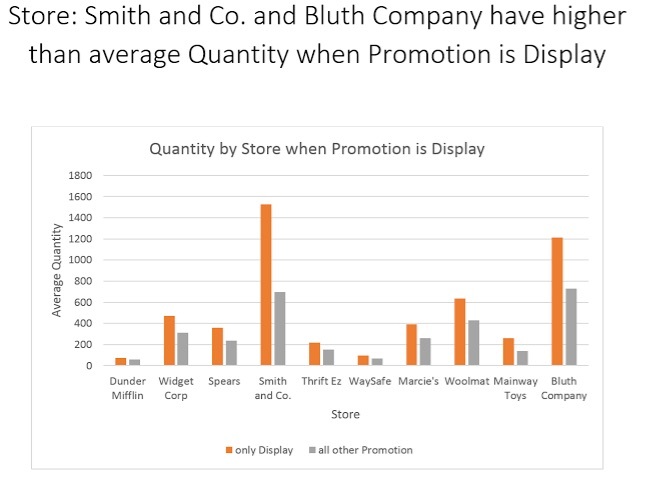 But, using dynamic dashboards—with entirely new analyses, charts and graphs that automatically populate based on smart pattern discovery—retailers could spot these trends and react accordingly, perhaps offering extra discounts for online shoppers in the northeast, or promoting higher-ticket items in the south where customers will save on the sales tax. With real-time analytics, it’s easy to see the specifics of what’s happening at the individual store level and make adjustments, rather than trying to figure out what went wrong come January 1. Drill down into specifics. Most predictive models are very limited, able to consider only a few hundred factors at a time. For a clothing retailer, that means you might have some clue about trends in various regions—such as the most in-demand boots in the Northeast or this season’s “in” colors in the Deep South. But, what if you want to be more specific? What if you could know what heel height is the most desired in boots for women 30-44 in metro Atlanta? Or which colors of cashmere cowl neck sweaters are most popular with women ages 24-36 in suburban Boston? Conventional BI analytics can’t dive that deep to give you the answers required to optimize distribution and merchandizing at that level. You need one-click, instant analytics that can examine millions of questions, build hundreds of models and help you understand the subtle differences in just minutes. Despite their best efforts and most sophisticated systems, even the savviest retailers in the world may still get it wrong this holiday season. But, with current, timely insight into how, when, why and where consumer buying behavior is changing, those that leverage smart pattern discovery can capitalize on trends and overcome challenges right down to the wire on the 2015 holiday shopping season. Before founding BeyondCore, Arijit Sengupta +held a variety of technical and management positions at Oracle and Microsoft. Arijit has been granted a dozen patents in advanced analytics, business process as a service, operational risk, privacy and information security. Arijit has guest lectured at Stanford; spoken at conferences in a dozen countries; and was written about in The World Is Flat 3.0, New York Times, San Jose Mercury News, Harvard Business Review and The Economist. Arijit holds an MBA with distinction from the Harvard Business School and Bachelor degrees with distinction in Computer Science and Economics from Stanford University. Need more Point of Sale News? Check out these categories with hundreds of articles. Subscribe to the Point of Sale news for free – use the link on the left side menu above. Need more data? Pointofsale.com has over 4,000 articles. Use the Search link on the left to find what you need. Use quotes for “multi word searches”.